CleanerFag seems to have given up. 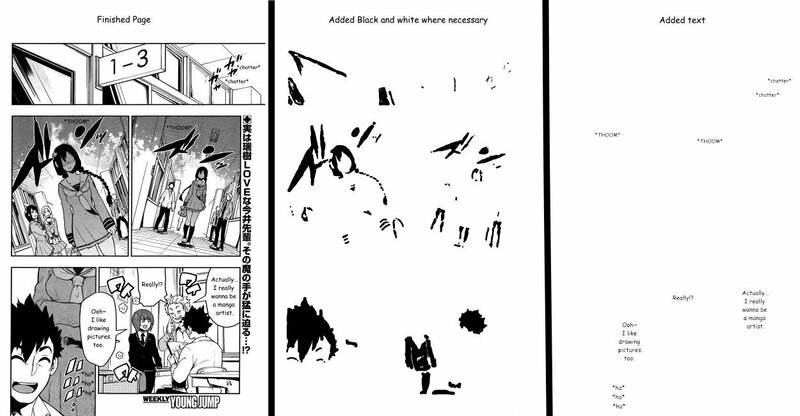 If anyone wants to take over cleaning / redrawing / typesetting, I’ll keep translating. Scanon’s suuuuuuper busy, and I’m dealing with some real life problems at the moment. We are looking to recruit some experienced members. We need a Cleaner-redrawer and a Typesetter. Please e-mail samples of past work to cf@tfwno.gf. We could also use a Japanese to English Translator. Please e-mail samples of past work to tc@tfwno.gf. This entry was posted in Uncategorized on 2015-10-31 by CleanerFag. Hi! When I started doing them, I just wiped the text bubbles and added in the English text (issues 72 to 79). Then I started getting better at it, and did more work and redrew stuff and colored in the black (issues 80 to 92 – with some pages just the text added – I get tired at 3am LOL). Totally just for fun. I had them all as just image links, but converted them all to *.cbr format (free comic book reader). I enjoyed the manga so much that I had to try playing with them. I don’t have PhotoShop or PaintShopPro, I use a free program called PaintNET. I’ve also cleaned 5 covers (so far) and made them pin-ups, posting them in a thread on Batoto. Admittedly, I’m not super experienced in this field. I’ve always wanted to jump into it, but most projects don’t really want someone without much experience, and it’s therefore hard to start and get such experience. Anyway, I could likely help with cleaning, typesetting, quality control, and editing. I’d love to try my hand at the former, but only as a side-project until I feel I’m confident enough to actually contribute something of acceptable quality. On the other hand, I feel I would be of great help with quality control and editing, and typesetting to a slightly lesser extent due to not having too much experience in it. I love this series and the work you put into it, and I would absolutely love to build and hone my skills whilst working alongside you. I’m available pretty much all weekend and any weekday past about 5 o’clock EST. I can be contacted at any time. I’m sorry for have translated chapter 68 of Boku Girl. I released it today and at the same time i saw on mangahere that you released it too. I made all the work by myself so obviously your work is better. Just for info =) Keep on with your great work ! You should pick it up, because it seems Aereus quit. I must say before I tried, I didn’t know how hard it was for you guys to work as typesetters or cleaners… I was watch you live stream yesterday and saw how much effort you put in to each and every chapter… I would really like to help you guys with the series.. But I have no experience with typesetting or cleaning, although I try to learn. Anyway!.. Keep up the amazing work, and I would love to try one time in the future to help you guys out..